The Government of Myanmar intends on strengthening the economy of the nation in the years to come. The construction of new housing units along with multiple ambitious infrastructure projects across as telecom, hospitality, healthcare and manufacturing are expected to be the key drivers behind the growth of the Myanmar diesel genset market during the forecast period. The Southern region accounted for the highest Myanmar diesel genset market share by region in the overall diesel genset market, in 2017 and is expected to continue dominating the market revenues in the forecast period as well owing to several upcoming infrastructure projects in the Kyaukphyu Special Economic Zone in Rakhine and Thilawa Special Economic Zone in Yangon. 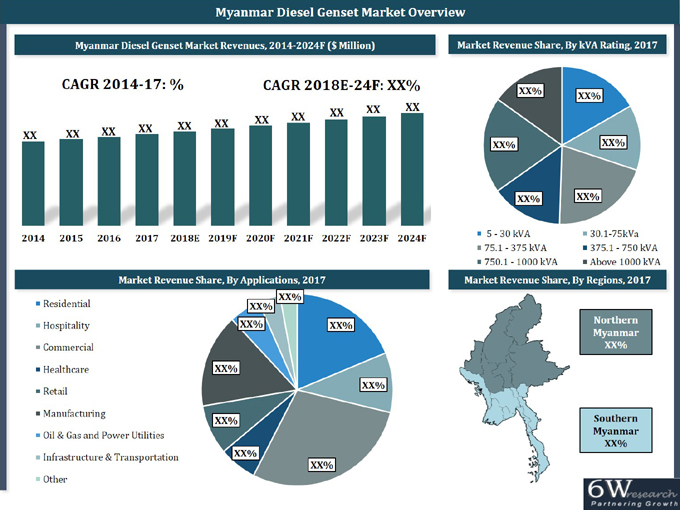 The Myanmar diesel genset market report comprehensively covers the Myanmar Diesel Genset Market by kVA ratings, applications and regions. The Myanmar diesel genset market outlook report provides an unbiased and detailed analysis of the Myanmar diesel genset market trends, opportunities/high growth areas, market drivers which would help the stakeholders to device and align their market strategies according to the current and future market dynamics. •	Historical Data of Myanmar Diesel Genset Market Revenues & Volume for the Period, 2014-2017. •	Myanmar Diesel Genset Market Size & Myanmar Diesel Genset Market Forecast of Revenues & Volume, until 2024F. •	Historical Data of Myanmar Diesel Genset Market Revenues & Volume, By kVA Ratings for the Period, 2014-2017. •	Market Size & Forecast of Myanmar Diesel Genset Market Revenues & Volume, By kVA Ratings, until 2024F. •	Historical Data of Myanmar Diesel Genset Market Revenues & Volume, By Applications for the Period, 2014-2017. •	Market Size & Forecast of Myanmar Diesel Genset Market Revenues & Volume, By Applications, until 2024F. •	Historical Data of Myanmar Diesel Genset Market Revenues, By Regions for the Period, 2014-2017. •	Market Size & Forecast of Myanmar Diesel Genset Market Revenues, By Regions, until 2024F. •	Myanmar Diesel Genset Market Trends and Developments. 14.3 Denyo United Machinery Pte. Ltd.
14.4 Deutz Asia-pacific (Pte.) Ltd.
14.5 FG Wilson Asia Pte Ltd.
14.6 Mitsubishi Heavy Industries Engine System Asia PTE Ltd.
14.10 Yanmar Holdings Co., Ltd.